Took shots of the launch of 'The Hazel'; a 100 year-old wooden canal boat (they are usually made of steel - wooden ones are quite rare). 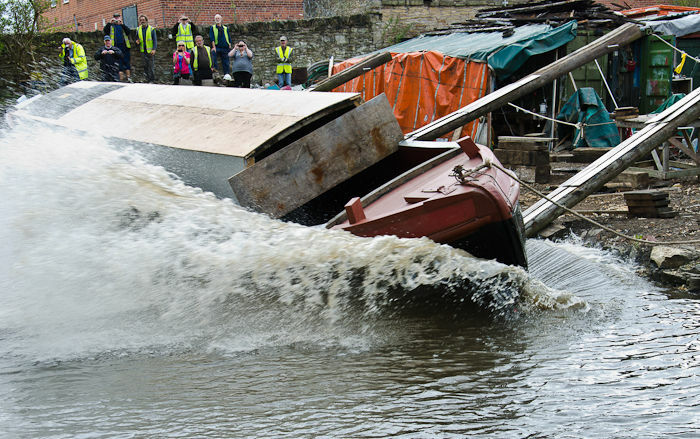 She is in the process of being restored by volunteers of the Wooden Canal Boat Society (WCBS), which is based at the Heritage Boatyard on Knowle Street in Stalybridge. The Hazel was launched into the Huddersfield Narrow Canal this week, after the oak hull was thoroughly restored and coated with the customary black tar. The superstructure and interior will now be rebuilt. The launch was attended by the Lady Mayor of Tameside, Brenda Warrington, and other dignitaries. Instead of the champagne more customary for ocean-going liners, The Hazel was anointed by the smashing of a bottle of beer across her hull by her former owner. The bottle contained 'London Pride'. Rumour has it that no-one was prepared to see proper northern beer wasted.